Place settings and how to style by mixing and matching what you already have in your home. I have more than a slight obsession with dishes and every single time that I bring home a new set or just a few single pieces of mismatched china I get that giant eye-roll from my husband. Come on now…admit it. You know just what I am talking about! I’m not really sure why I love dishes perhaps more than anything that I collect but I try and limit my collectibles to things that are usable and not just decorative in nature. You have likely heard the quote from the 1800’s English textile designer/artist William Morris that is SO TIMELESSLY TRUE “Have nothing in your houses that you do not know to be useful, or believe to be beautiful” I am trying to be most mindful of that as I thin out some of my collections in preparation for some changes in 2018. Only what you/I love…and are beautiful…and useful. I’m not very formal in nature and in fact never was one of those girls who cared about a wedding registry. Here it’s yoga pants and flip flops 90% of the time that I’m home and yet when I set a table because someone is coming or just to photograph for a project I suddenly do my best Martha and set something lovely. After having lived in this house over 25 years now my dish collections have taken on a life of their own! 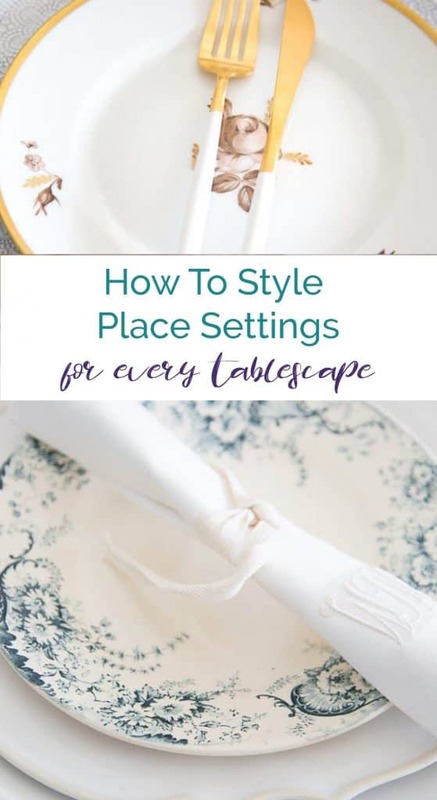 Today I thought that I’d talk a bit about how to style patterns and place settings and shake things up. Affiliate links provided for your convenience. Click here for my full disclosure policy. No matter what the tablescape is going to look like in terms of flowers and other decorative objects I recommend stacking plates. I just do what I like and break any formal rules and highly recommend being a REBEL TABLESCAPER very much! Just as I always advise with decorating, it’s your table and your life…so do as you wish! 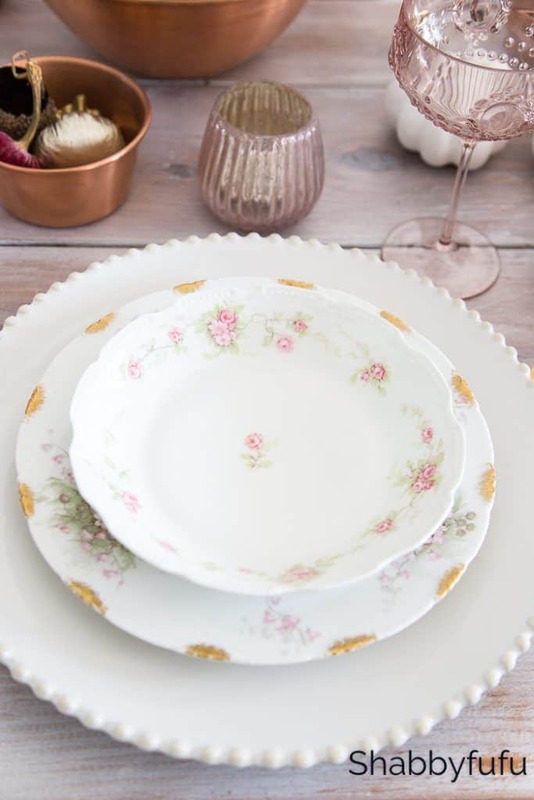 What I like to do is to start out with a PLAIN WHITE CHARGER PLATE, or sometimes if I’m feeling glitzy a ROSE GOLD CHARGER or even another metallic charger plate. Chargers are great to use instead of placemats on a bare table and really catch those drips and crumbs. Above is a mismatched set and the top shallow bowls were inexpensive flea market finds. 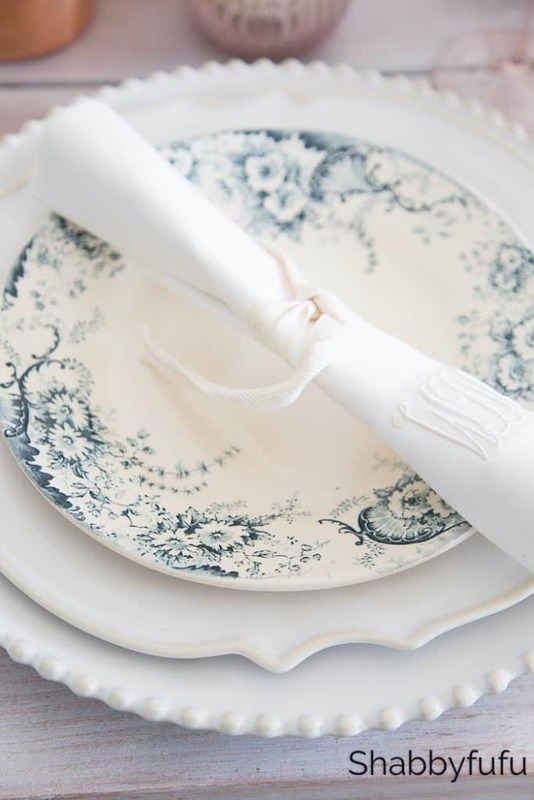 Vintage + New are marriages made in tablescape heaven. 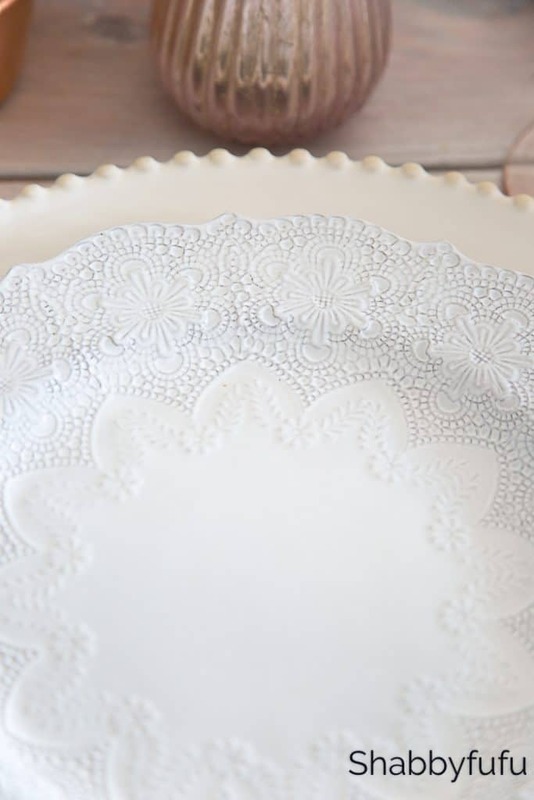 Texture on texture when using all white and cream dishes and I love how both the charger and the dinner plate have decorative edges that are different. 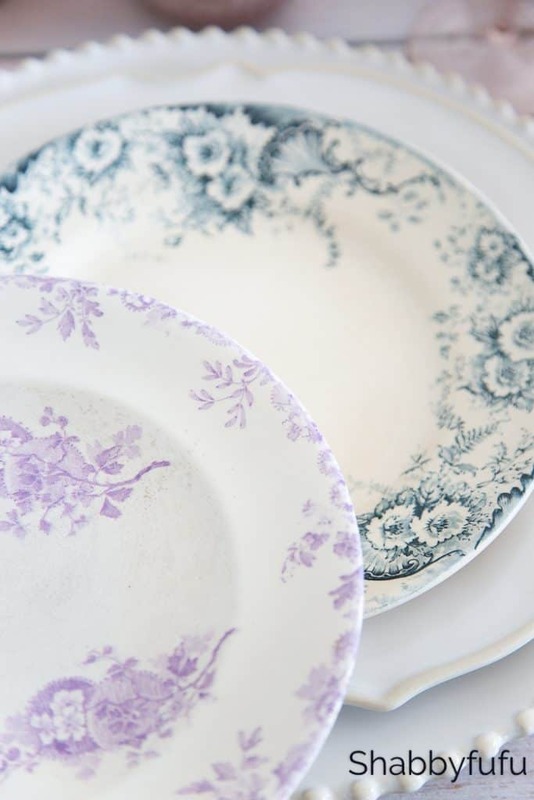 You can find the CHARGER plate HERE and the LACEY DINNER plate HERE. 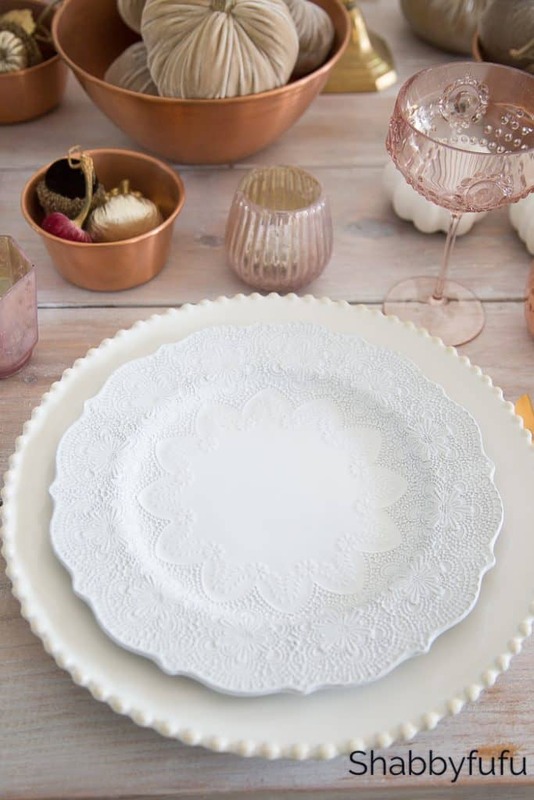 With WHITE on WHITE or TONE on TONE it’s all in the details like the lace look of the dinner plate. 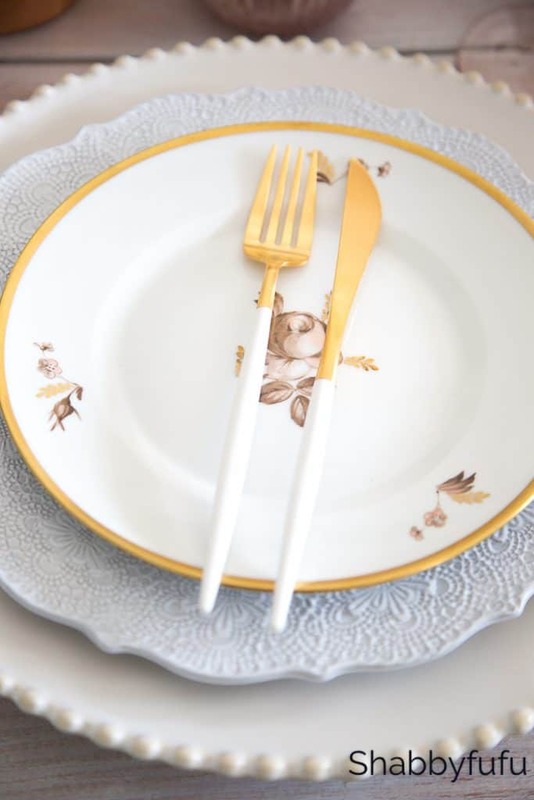 For Thanksgiving I always bring out my husband’s family’s heirloom china, which is a full set of his mom’s ROYAL COPENHAGEN that reminds him of his childhood in Switzerland. 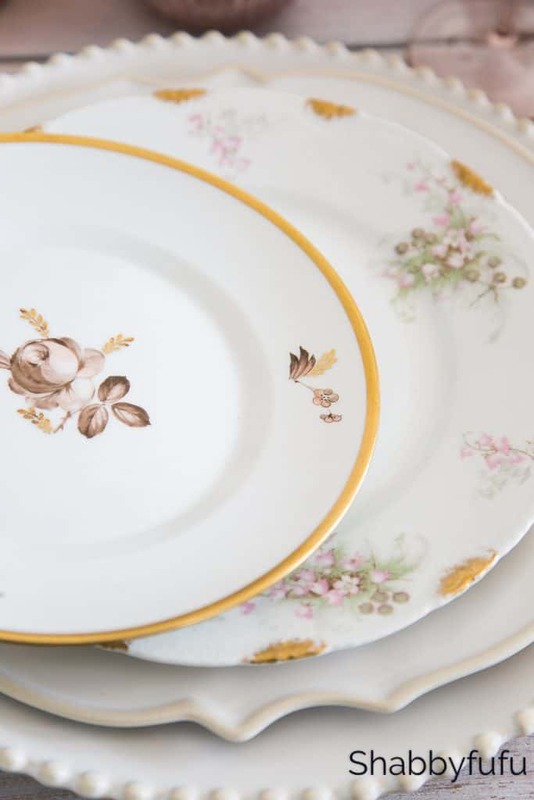 Even though we have MANY pieces and it’s a full set, I prefer to layer and only have the heirloom china on the top plate. The gilding on the rim is picked up by THIS SET of MODERN flatware, and juxtaposes vintage and modern…but all in the same tones. 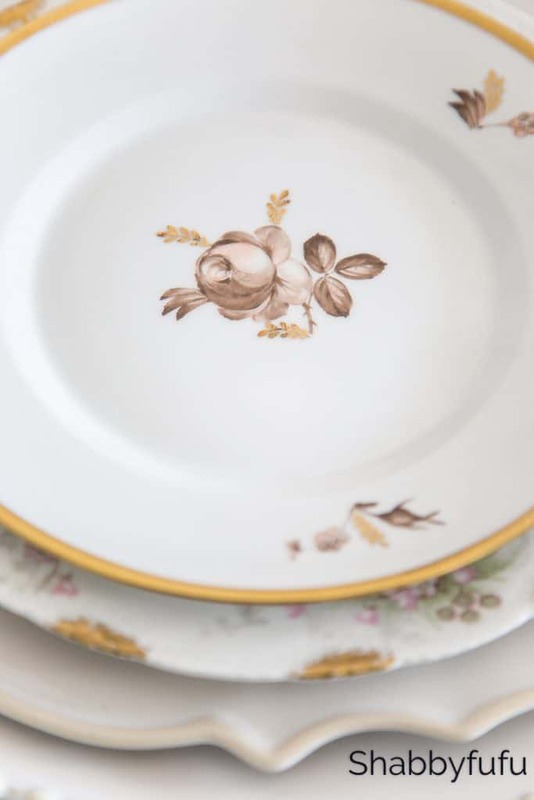 Antique delicate and feminine French Haviland Limoges plates have that some touch of gold and pink roses. With the pink a choice that I’ve made to layer and bring these out means that I’ll want to add more pink table touches. 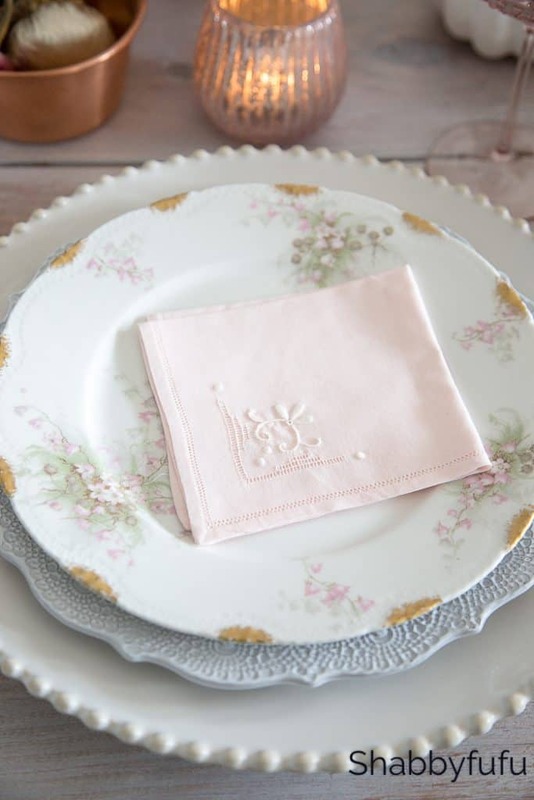 I OMBRE DYED these vintage white linen napkins and love the softness of the pink tones with pink flowers on the table. Tutorials for OMBRE DYING are found HERE and HERE. 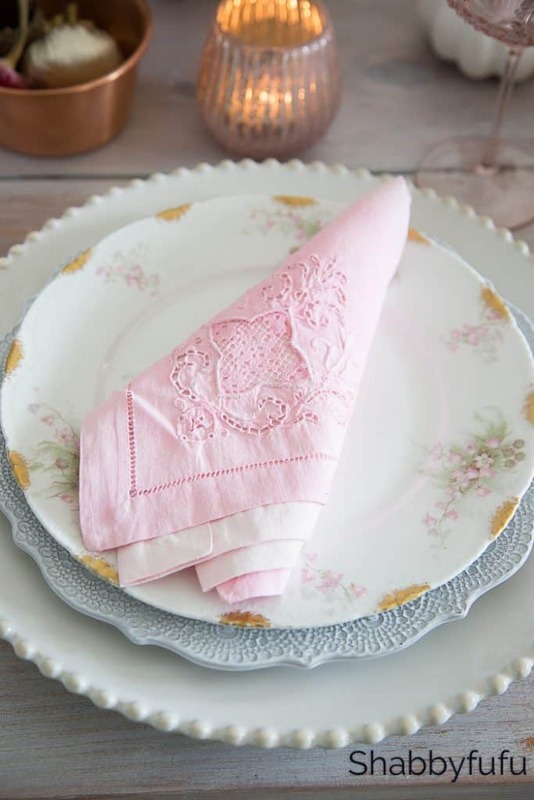 Don’t be afraid to play around with napkins and try bringing out the color of your dishes and plates in the fabric. Stack, layer and play and as long as you keep in mind something that will connect the patterns in terms of hue…you should be fine. I have nothing bold here…all of my colors are soft and that’s what makes this work.